Last week, primary two went on a hunt around the school to look for the different types of homes. Before we set off, we predicted the most and least popular. We used tally marks to record each type of home and then displayed our results in a bar graph. We discovered that our predictions were correct and that a flat was the most popular! A letter delivery for P2! 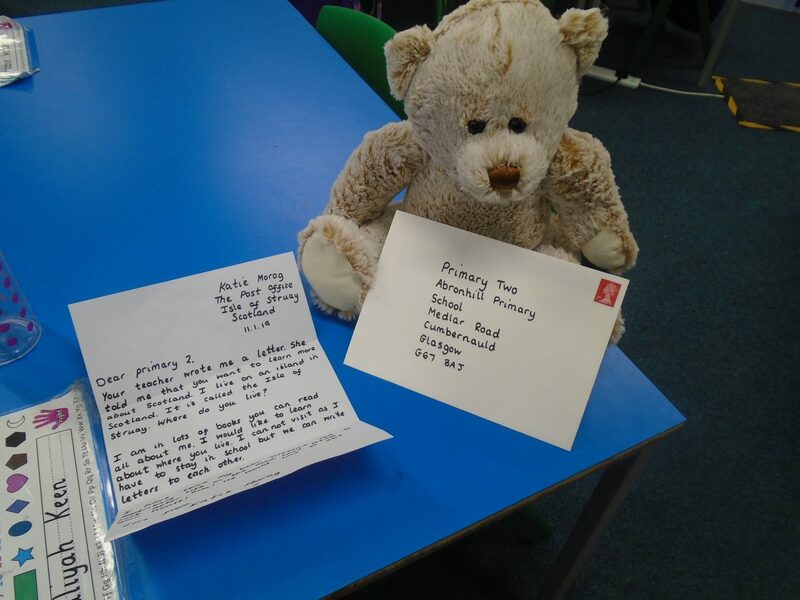 A letter was sent to primary 2 today from Katie Morag all the way from the Isle of Struay! Mrs McCormack sent Katie a letter to see if she would help the boys and girls to learn about living on an island in Scotland. Katie sent a letter back to say yes and that she would like to learn about living on the mainland in Cumbernauld. She sent us her teddy Tiresome Ted for us to take home each night with postcards to write to Katie. We had so much fun learning outdoors. We enjoyed going on a community walk to the park. We also read the story ‘Leaf Man’ and then created our own leaf art. We worked with a partner to search for real phoneme words and nonsense words. We read each word and then posted the real words into the postbox and gave the nonsense words to the bin! We used rulers to measure the length of leaves and sticks we found in our garden. Dinosaur fun for primary two! We have been very busy learning all about Dinosaurs. We have been plotting where Dinosaur fossils have been found on a map of the world and making our own fossils! We have been looking at what the world was like when Dinosaurs were here and writing facts about it. We have even linked our topic to our maths learning by using Dinosaur mats and cubes to measure the height and length. Here we are having lots of fun learning in the playroom! A special delivery for primary 2! As a class, we decided that we wanted to learn all about Dinosaurs. The next day, a letter was sent to our classroom from a paleontologist asking us to follow the instructions. We went out into the playground and followed the instructions to turn left, right and walk forward which lead us to the outdoor classroom. We then discovered a box and inside and we found Dinosaur bones!! We were so excited! In the classroom we learned what it would be like to be a paleontologist and study bones and fossils. We then had a go at being paleontologists, investigating the ‘bones’ (cookies) in the ‘dirt’ (chocolate powder). It was great fun! We have loved having special visitors in the school. We have enjoyed watching them grow and learning all about the life cycle of chickens. We have kept a chick diary to record daily changes. We are excited to take our diaries home and share our learning with our families. As part of our outdoor learning, we went on a bus from our school to visit Palacerigg. We saw lots of farm animals and had lots of fun! Here is what we thought! Amy ‘We got to play in a play park’. Jacob ‘There was a chicken with a funny haircut’. Ellie ‘We touched the animals’. Lewis ‘We saw a funny animal. It was a billy goat’. Eva ‘We took lots of photographs’. Tyler ‘We saw bunny rabbits’. Evan ‘We got to see the baby chicks and the big animals and their parents’. Annalise ‘We went in the tiny house’. In maths we are learning about money and are really enjoying it so far! We have been learning to recognise coins and count out amounts to 10p using 1p, 2p and 5p coins. We have a Farm shop in our classroom! We are loving role playing in the shop, creating amounts of money and handing the shop keeper the correct coins. Here are just some photographs of us in action! P1/2 learn to tell the time! We have been learning to tell the time on analogue and digital clocks. We can read o’clock and half past times. We have enjoyed playing time bingo and using the clock mat. This morning we had a visit from Mrs Boland who told us the Easter story. We then worked as part of a team to make a jigsaw showing Jesus on the cross and Jesus rising from the cross. Thank you to Mrs Boland for her time!